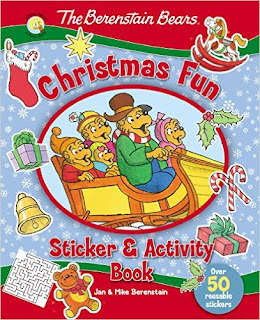 The Berenstain Bears Christmas Fun Sticker and Activity Book is a super fun activity book for kids! My kids love the Berenstain Bears so when they saw this Berenstain Bears Christmas Fun Sticker and Activity Book they were stoked. They love that it comes with over 50 reusable stickers and has fun activities like puzzles and games throughout. I love that it focuses on why we celebrate Christmas and gets kids involved. The Berenstain Bears Christmas Fun Sticker and Activity Book is a wonderful way to keep kids entertained and would make a terrific stocking stuffer this Christmas! You can find The Berenstain Bears Christmas Fun Sticker and Activity Book by Jan & Mike Berenstain on Amazon, Barnes and Noble and other bookstores.